As organisms that cannot swim against the currents, plankton are intimately connected to their physical environment. Many species are quite sensitive to the temperature, salinity, and nutrient levels that either lead to their proliferation or demise. Physical conditions and nutrient levels can lead to high abundances of particular plankton types. These plankton “blooms” are common throughout the world’s oceans and can be composed of phytoplankton, zooplankton, or gelatinous zooplankton, depending on the environmental conditions. Generally phytoplankton (plankton that use photosynthesis like plants) need nutrients and light to grow at very high rates. Since light is readily available in the surface ocean, nutrient availability is the most important driver of phytoplankton blooms. Phytoplankton blooms of most concern to environmental monitoring groups are often described as Harmful Algal Blooms (HABs). Some HABs composed of diatom species Pseudo-nitzschia spp. or the dinoflagellate Karenia brevis can produce toxins harmful to copepods, fish, and higher trophic levels like dolphins and humans. 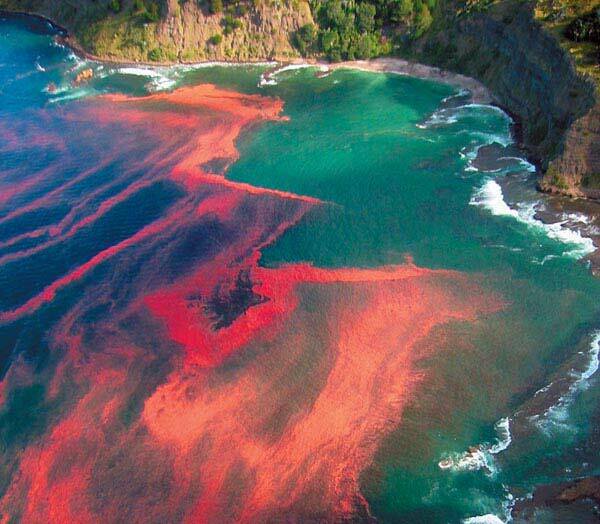 “Red tides” are actually blooms of Karenia brevis that sometimes lead to massive fish dieoffs. Other phytoplankton blooms are harmful not because of the toxins that they produce, but because of the processes that happen when the blooms die off: massive amounts of phytoplankton die and sink to the bottom where they are decomposed by bacteria. These bacteria use oxygen to consume the dead phytoplankton, creating large portions of the water column that are low in oxygen. Fishes and some zooplankton avoid these low oxygen zones, but gelatinous zooplankton seem to be able to withstand low oxygen conditions. These low oxygen regions are often referred to as “dead zones” because very few animals can live there. A dead zone occurs regularly in the summertime in the northern Gulf of Mexico and has been expanding in recent years. Reducing nutrient/fertilizer runoff from farmlands and cities is therefore crucial to limiting the growth of phytoplankton and maintaining healthy coastal ecosystems. A bloom of Karenia brevis viewed from the air. This “crimson tide” is only composed of small dinoflagellates, but it can have devastating consequences for a coastal ecosystem. Blooms of zooplankton can form via two different mechanisms 1) currents from different water masses merge to create a dense patch of organisms, or 2) consistently favorable conditions allow the zooplankton to reproduce faster than their predators can consume them. These two mechanisms are distinguished in the scientific literature as “apparent blooms” and “true blooms” (Graham et al. 2001). Apparent blooms can result from converging currents such as fronts, or the behavior of zooplankton aggregating along some kind of physical discontinuity, such as a thermocline. True blooms are typically the result of high food concentrations, high survival of larvae/juveniles, or a combination of multiple factors. For scientists, it is sometimes difficult to know what mechanism led to a zooplankton bloom, and they need to consider the history of the water masses where the zooplankton are found to figure out how the bloom formed (Greer et al. 2013). Zooplankton blooms associated with copepods are generally considered to be healthy for the ecosystem. The timing of copepod peak abundances with the first feeding of larval fishes is thought to be an important factor contributing to the variation in fish population abundances (Cushing 1975). Blooms of jellyfish, on the other hand, are often associated with ecosystems that are environmentally degraded through high nutrient input or consistent overfishing (Jackson et al. 2001), but there are some scientists who think jelly blooms are simply a characteristic of their life histories (Condon et al. 2013). More data on jellyfish abundances over longer time periods will help scientists understand relationships between the environment and the frequency of jellyfish blooms. You can also report jellyfish sightings at http://www.jellywatch.org. Here is avideo of one ISIIS downcast through the water column of near a frontal feature offshore of San Diego, CA, USA. It shows a bloom of Solmaris spp. 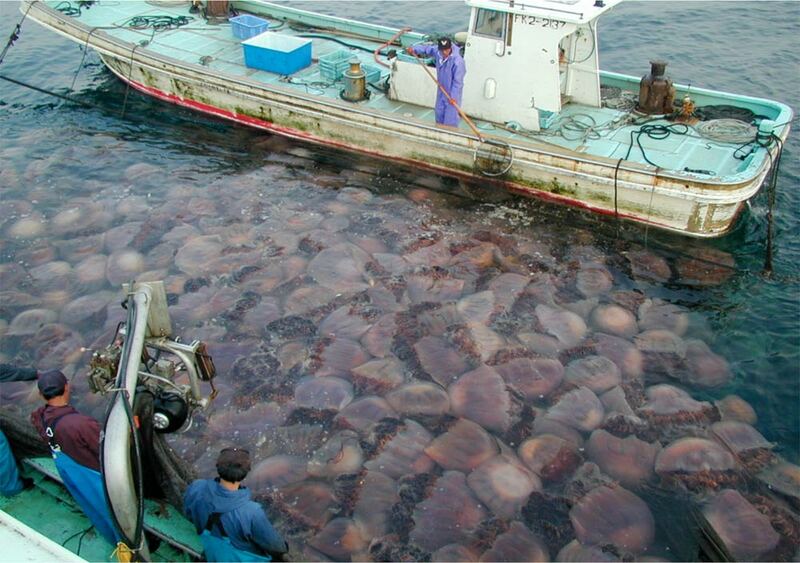 jellies concentrated near the surface. Convergent currents that are commonly seen at fronts likely contributed to the formation of this bloom. Akashiwo sanguinea does not produce toxins. It does produce a chemical that prevents birds’ feathers from drying, and it can deplete oxygen. You are right, Lauren. This was a mistake, and the error has been corrected. Thanks!